The zipper front of this lightweight poly-boned bustier makes it perfect for gentle constriction (2-3" reduction from natural waist size instead of 4-6" of our corset collection). The fabric is metallic woven and electrocoductive (beware if neon equipment is part of your performing). Looking for some extra sparkle with your see through lingerie? Looking for a fantastical foundation for your curvy alter ego? 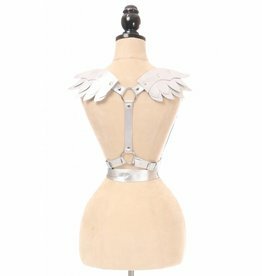 Looking for a vegan harness that adds characters? Winged characters that is!